Chocolate Party Favors for Kids can really make a party extra fun and exciting. For little children, it doesn't take much to impress. You can choose any one of the candy recipes for kids, or recipes for molded chocolate lollipops, chocolate apples, popcorn balls, or pretzel lollipops, and then package them in cute little cello favor bags with ribbons or twist ties from Candyland Crafts. The amount of ingredients needed will, of course, depend upon how many children have been invited to this fantastic party of yours. Hint: You should have enough chocolate in one package of chocolate chips to easily decorate 24 cones. 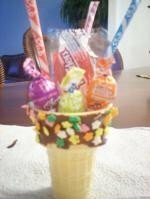 You can order chocolate melts along with the candy confetti, favor bags, ribbon or twist ties at Candyland Crafts. They have a great selection. Melt the chocolate over a double boiler, stirring constantly until smooth. Alternately, you could melt the chocolate in the microwave, but you must be careful not to overheat it. Stop and stir it every 30 seconds to be on the safe side. Dip the top half of each cone into the melted chocolate. You may find it easier to use a mini spatula or pastry brush and simply paint the chocolate around the tops. Do whatever works for you. While the chocolate is still warm on the cone, immediately roll in or sprinkle the confetti all around the edges. Place on a waxed paper covered tray to cool and set. Fill the cones with the candy selection. Start with the smaller pieces to fill the base so that they won't tip when you add the lollipops and crack your chocolate coated masterpiece. Insert each cone into a cello party favor bag and tie at the top with a colorful ribbon or twist tie. The kids will all be thrilled to get this appealing sweet treat. If you aren't the type to make your own chocolate party favors for kids, but you still want something special, consider a personalized chocolate candy bar favor. You can choose from a selection of themed wrappers to suit the age and tastes of your child. Every child likes to see their own name in print. This will be a treat not only for the guests, but an extra present for the birthday boy or girl. Browse through the selection at Candy Wrappers and Memory Wraps. They have chocolate party favors for kids of all ages and are sure to have something you will love, or will even create a new one to suit your needs. If you want to get the software and print your own wrappers for all different occasions, you can find it for a bargain price at The Dapper Wrapper and at Custom Candy Wrappers. Compare the two and see which program would be most right for you. Well, I hope these ideas of different chocolate party favors for kids have given you food for thought. Although the party favor is not the most important part of the party, it can really add to the festive spirit and make your child feel extra special.